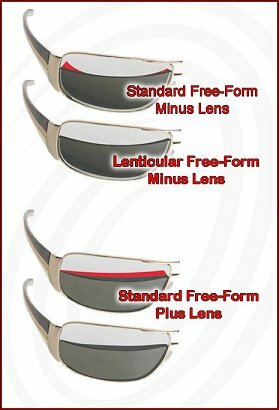 A Free-Form Lenticular lens utilizes the same free-form technology as our other digital prescription lenses, but the corrected portion of the lens does not extend all the way to the edge. This results in a lens that is 50% - 70% thinner. Lenticular Free-Form Lenses will result in the thinnest lens possible. 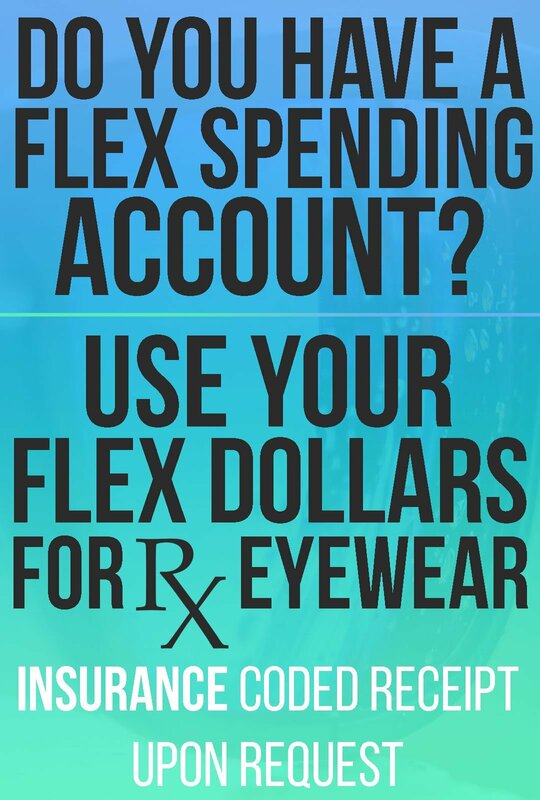 This is often the only lens choice available for very high prescriptions. Lenticular means the correction in the lens does not extend all the way to the outer edge of the lens. Since most people can't see this part of the lens this has been a non-issue. This results in a lens that is about 50% - 70% thinner than a lens where the prescription extends all the way to the edge. Curved lenses, or lenses in wrapped-style sunglasses, will be thicker than flatter prescription lenses. Wide lenses will be thicker than smaller lenses. 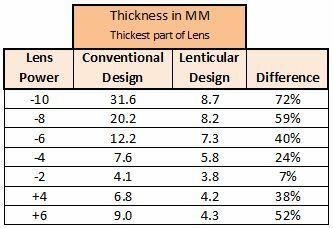 High index lenses will be thinner than polycarbonate or Trivex. Note: The Index of Refraction of Polycarbonate is 1.57. Trivex is 1.53. Our High Index lens has an Index of Refraction of 1.67. 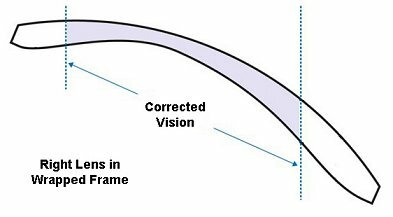 We do not change the curve of your frame, but in some extreme cases we can use a lens that is slightly flatter than the frame. We would edge the lens so the outside edges are slightly in front of the eyewear frame. This is reserved for a very few extreme cases. Typically the Lenticular lens will look like any other non-prescription lens, even if your prescription is usually out of range for the frame that you selected. This is why our new Lenticular design works so well. The power in your prescription is a result of having a lens with a front curve that is different than the back curve. So it is only logical that wider lenses will be thicker. With this Lenticular design the prescription does not extend to the portions of the lens that you do not, or cannot use. You still get all the same UV protection of a big wrapped pair of sunglasses without the thickness that is normally created with these larger wrapped lenses. High Index lens material will bend light more efficiently. So the higher the Index of Refraction, the thinner the lens will be. We can use high index lenses in any full-frame glasses. 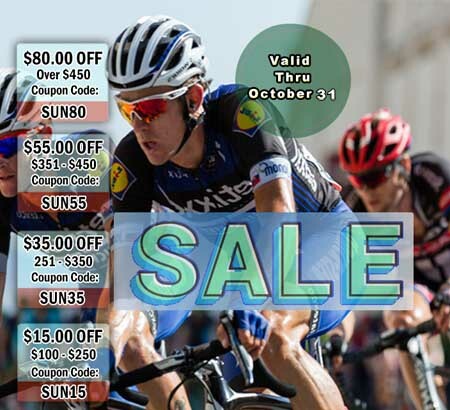 Polycarbonate or Trivex are the best choices for semi-rimless sports glasses because they are stronger than high index materials. 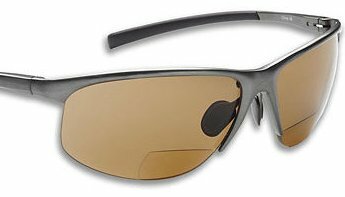 High Index lenses are not unbreakable, therefore we do not put High Index lenses in motorcycle glasses, shooting glasses, or other glasses that may be subject to severe impact. Bifocal lenses have a line that separates the distance correction on top from the reading section on the bottom. This reading section is all the same power, as opposed to a Progressive lens that gets progressively stronger as you look lower in the lens. Another major difference between a Bifocal and a Progressive lens is that Bifocals are not surfaced with a free-form design. The free-form digital designs recalculate the curve at every point on the back of the lens so every part of the lens is in focus. Bifocals are surfaced with the traditional technology. This is acceptable on flatter lenses and more mild prescriptions. On wrapped frames this will cause a fishbowl effect in the peripheral portions of the lens. This distortion will be more exaggerated in higher prescriptions. Don't hesitate to give us a call at our toll-free number, (800) 831-9083.